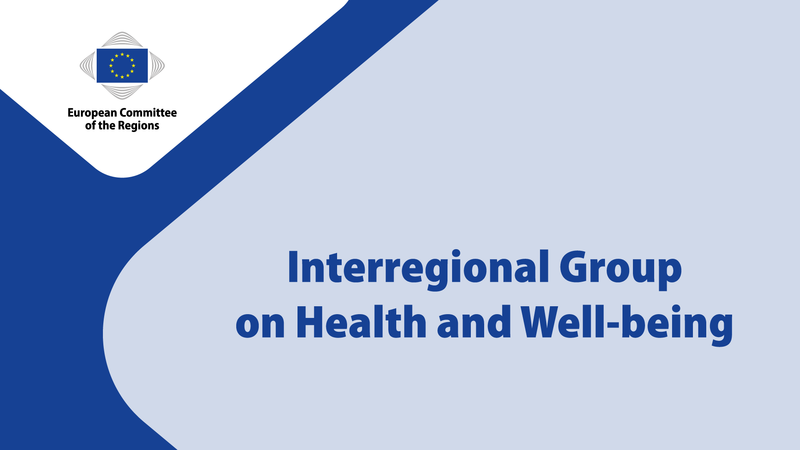 Interim Chair, Karsten Uno Petersen, opened the meeting and welcomed all participants and speakers to the meeting of the Interregional Group on Health and Wellbeing on the topic “Health Systems Performance Assessment – The role of regions”. He informed of the availability of interpretation available in Spanish and Polish and reminded all participants to sign the attendance sheet. The agenda was adopted without amendments. The Chair informed that, as was announced during the previous meetings of the group, he is stepping down as Chair due to his new commitment as political coordinator of the NAT committee. He further informed that a new Chair was elected: Birgitta Sacrédeus (Dalarnas läns landsting (SE)). She was subsequently given the floor to proceed with the meeting. On behalf of the group, Ms Sacrédeus thanked Mr Petersen for his commitment and support to the group during his time as Chair. She moved on to give the floor to the first speaker, Mr Federico Paoli from DG SANTE, unit “Performance of National Health Systems”. Mr Paoli presented the Expert Group on HSPA, which was established by the European Commission and Member States in September 2014 upon invitation from the Council Work Party on Public Health at Senior Level. States established five working groups on different topics, among which one focused on the measuring and monitoring of the effectiveness of health investments. – Focus on specific topics which are a priority for the Member States and for the EU policy agenda. In 2014, the Commission published a Commission Communication, proposing an EU agenda on effective, accessible and resilient health systems, suggesting actions that could be taken by Member States/regions in cooperation with the Commission to bring about improvements in this area. The first step in this work was to develop HSPA, subsequently the HSPA Expert Group was set up primarily aiming at the four above-mentioned objectives. The Expert Group on HSPA is composed by experts from each Member State, representatives from the WHO European Region, OECD and the European Observatory on Health Systems and Policies. The group is co-chaired by Sweden and DG SANTE and aims at identifying priority areas in which HSPA tools and methodologies can be delivered. Mr Paoli wished to underline that the group is not focused on ranking and comparing Member States, but to foster the sharing of experiences to support Member States, in close cooperation with international organisations. The group started its work with the identification of priority areas, including quality of care, integrated care, effectiveness, primary care etc. It meets frequently, organising every second meeting in a difference EU MS. The first part of the meetings is dedicated to the sharing of experiences, while the second part has a methodological focus, involving the representatives of international organisations, EU projects etc. By the end of the first year, the group published a report on quality of care, which was the first issue area selected by the group. The report contains a spectre of experiences from countries, including a wide array of scope and methodologies. The report is available online through this link. The report also includes an interpretation of cross-country variation in a few quality indicators. The used methodology was the performance framework- a simplified version of the OECD framework, focusing on the assessment of effectiveness, patient safety, patient centeredness, accessibility, efficiency and equity. Mr Paoli further briefly presented other examples of quality assessment taken from the report, showing the variety of methodologies and subject fields undertaken, including assessment of varieties in mortality for disorders of the cerebral circulation by category of provider; monitoring provision of essential levels of healthcare (LEA); and maternal deaths per 100 000 live births. The conclusions of the report are grouped in three groups; Quality assessment is a piece of a bigger puzzle; Choice of indicators and concerns on data quality; Communication and follow-up of the results. On the next steps of the Expert Group, Mr Paoli informed that the priority topic of 2016 is integrated care. In 2017, the group will focus on primary care systems. Mr Paoli again emphasised that the final goal of the Expert Group is to support to national policy makers and the group will start to provide assistance to countries. Alex Hicks gave an introduction to Wales, which has a population of 3.1 million. Projections show that by 2025, the Welsh population will have increased by 26%. Some of the Welsh health challenges include an ageing population (19% of the population are aged 65 or over); persisting health inequalities, despite improved life expectancy and decreasing gender gap; and high obesity levels, especially in deprived areas. Sustainability of health systems is a key issue for the Welsh government and a golden thread between the international health goals of the Health 2020 policy framework and Welsh policy. One of the main pieces of legislation is the “Wellbeing of future generations act”, which represents a basic drive to move from output to outcome measurement. A principle of sustainable development runs through the health and wellbeing goals. The other main piece of legislation in the area is the “Social services and wellbeing act” which took effect in April 2016 and represents a new legal framework to bring together and modernise social services law, with prevention at its core. patients and avoids wasteful care that is not beneficial to patients. Prudent healthcare is about avoiding pushing people up the levels of intervention and instead increase and improve the efforts taken at primary care level, at population level and at citizen level. The principles of prudent healthcare transcend all boundaries and can be understood in a wider international movement, linking to many other initiatives and campaigns. As an example, Mr Hicks referred to the Too much medicine campaign (BMJ). An implementation Action Plan was published in February 2016, which is closely aligned to the principles of co-production and co-design. The Chair thereafter opened the floor for questions. One participant asked DG SANTE how support is organised to the members of the Expert Group and whether governance is included in the working plan. Mr Paoli emphasised that the Commission do not provide technical assistance, but may provide facilitating fora. One example was the Rome seminar on the assessment of integrated care where experts from the HSPA Expert Group had the possibility of discussing directly with the national authorities. Outside the HSPA process, the Commission provides assistance through the usual tools, including the ESIF and the EU Health Programme. Regarding governance, the idea of the Expert Group is to work specifically on governance through peer assistance. On a question of potential synergies between the Expert Group and the European Semester, Mr Paoli informed that they are separate processes without explicit links, unless these are taken at the national or regional level. National decisions are however not within the scope of the group. harmonisation, but to try to mutually understand how to measure and improve quality. One participant asked Mr Hicks about staff training and staff expertise, and more precisely how to retrain and attract new staff to the new aims. Mr Hicks informed that they are currently in the process of developing a workforce and recently completed and independent workforce review. On a question on any potential pitfalls in developing the Welsh model for prudent healthcare, Mr Hicks said that the social movement model has proved difficult. There are ongoing discussions on how to develop a matrix to implement prudent healthcare in the longer term. Here, one of the challenges include to properly incorporate HSPA. The Chair thanked all participants and the interpreters and said that information about the next meeting will be circulated in the weeks to follow.